I’m so tired of racing around everywhere. I’m so tired of dreading going to work. I’m so tired of hurrying home to start my “second job” of dinner and laundry and house cleaning. Shame on me!! What about all of those who have been devastated by all of the natural disasters all over the world? Those who are oppressed. Those who are fighting for our country. Those who are suffering in poverty. I am so ashamed of myself. I am thankful for a car to drive and for all of the things I get the privilege to do. I am thankful for a job to go to. I am thankful I have a house to come home to. I am thankful I have clothes to wear and food to eat. And I am so very thankful that I have a family to take care of. 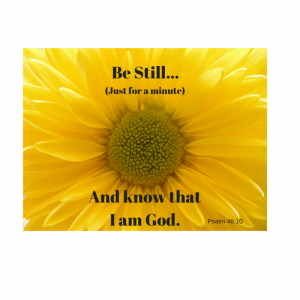 So if you are having one of those days, too, stop with me…..just for a minute…and know that HE is God and HE is in control of it all. This entry was posted in devotional, inspirational, motivational, spiritual on September 19, 2017 by Deanna Young. Oh that’s been me lately. What a great reminder. Your messages always so timely. God bless.